Another Halloween has come and gone; another collection of (mostly) happy trick-or-treaters with candy in their sacks and elevated heart-rates from their visit to the haunted (for one night) Family TreeHouse! For All Hallow’s Eve (a.k.a. Halloween), most people keep a bowl of candy by the front door and leave their front-door light on for the trick-or-treaters; maybe a jack-o-lantern on the step as well, but that’s it. We do a bit more than that. First we set up a fairly powerful sound system – this year it was a 35-year-old Dynaco ST-120 (60 Watts per channel) power amplifier driven by a 40-year-old Dynaco PAT-4 stereo pre-amplifier with a 30-year-old Shure M688 stereo mixer as input. Attached to the mixer was a CD player and an Audio-Technica AT814 unidirectional cardioid microphone. All this is set up just inside the front door, with the speaker wires passed through a window behind the bushes and out to the front landing, where it drives a Cambridge Soundworks Ensemble IV satellite and subwoofer speaker system, with the satellite speakers mounted on the brickwork above the front door. Then we place a scary-looking witch (an old house-dress and leggings stuffed with pillows, and a horrible mask on a fake head, with a pointed witch’s hat) sitting on a small chair by the front door, and the subwoofer goes UNDER the witch’s chair, out of sight, but definitely NOT out of ear-shot! We set up a foot-light in front of the witch to illuminate her, with yellow cellophane covering the bulb for an eerie glowing effect. This year we put a pumpkin in front of the light so it wasn’t easily visible from the street. We also cover the front door light up above this all with the same yellow cellophane to extend the eerie glow to the entire scene. 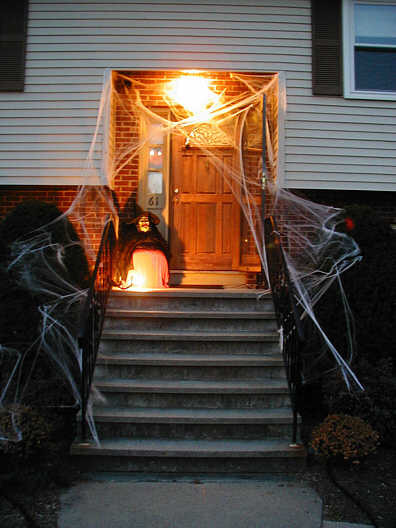 Finally we stretch spider-webs all over the front area, over the bushes and the speakers and the door and the witch. This is a photo from a previous year’s set-up (we forgot to snap pictures this year), and on YouTube there’s a clip with sound and motion from a windy Halloween night in 2009. We play scary sound effects and Halloween music, and when kids come to the door, the witch talks to them because the sound system is also a PA system with the microphone in the house! We start off the evening (when the little kids are out) with fun music (including Casper the Friendly Ghost and The Addams Family theme song). The witch “talks” to the early trick-or-treaters in a friendly voice so as not to scare the willies out of the little kids (we’ve had disasters in the past with little tykes running away screaming and crying!). As the evening gets later, and the older kids are out, the music and sound effects get creepier and the witch gets surlier and nastier! We’ve had teenagers run screaming from the house on occasion! Most everyone – young or old – gets startled and their heart races a bit when the witch talks to them directly and even comments on costumes or answers questions (we can hear what they say through the closed door)! It used to be that we were the only decorated house in the neighborhood for Halloween night. A bunch of neighbors have caught up with us over the years, though, and some have surpassed us (strobes, fog machines, coffins, headstones, etc. ), but we don’t feel the need to ratchet it up to keep up. It’s enough as it is.